New Caledonia  (French:Nouvelle-Calédonie) is a dependent overseas territory of France lying in the western Pacific Ocean, in the Coral Sea, to the east of Australia and west of Vanuatu. The territory consists of the main island of Grand Terre, the archipelago of the Loyalty Islands (Iles Loyaute), the Isle of Pines (Ile Des Pins) and numerous small, sparsely populated islands and atolls. New Caledonia offers beaches, mountaintop fondue in chalets, camping, hiking, amazing snorkelling and diving, and fabulous French food. 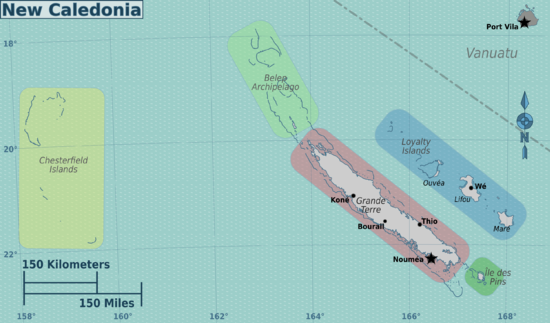 There is a general move towards more autonomy in New Caledonia and it was decided in the Nouméa Accord that the territorial Congress will have the right to call, at a time of its choosing, for a referendum on the future status of the territory (including possible independence) after 2014. Settled by both Britain and France during the first half of the 19th century, the island became a French possession in 1853. It served as a penal colony for four decades after 1864. The islands have been an overseas territory of France since 1956. The 1988 Matignon Accords grant substantial autonomy to the islands; formally under French law. Agitation for independence during the 1980s and early 1990s seems to have dissipated. A referendum on independence was held in 1998 but did not pass; a new referendum is scheduled for after 2014. In New Caledonia, as elsewhere in France, the national holiday is Bastille Day (14 July). New Caledonia has a semi-tropical climate, modified by southeast trade winds. It is often hot and humid in January and February. The islands are subject to tropical cyclones, most frequent from November to March. During winter (April to August) the daytime temperature is around 22C. The water may still be warm, but it often feels too cool to really want to go swimming. The main island of New Caledonia is one of the largest in the Pacific Ocean and its terrain consist of coastal plains with interior mountains. The highest point is Mont Panie (1,628 m). Grand Terre is rich in minerals, and is an important source of many ores, mainly nickel and chromium. There is a mountainous interior green with subtropical foliage. The outlying islands are coral-based, and have stunning white sand, and sport palm trees. The main island. It is one of the largest islands in the Pacific. The barrier reef lying off New Caledonia is second only to the Great Barrier Reef in size. Three large populated islands just east of Grande Terre. Was one of the few places in the Pacific with trees tall and sturdy enough to provide replacement masts for ships. The islets and reefs to the north of Grande Terre, with a small community living on Belep Isle. Uninhabited and incredibly remote, the Chesterfield Islands are an expedition. Hienghene - Where you can view the rock formations that look like 'a hen' and 'a sphinx'. One of the best towns to view ilots off shore. Sarramea - A small town nestled in the mountains with some excellent hiking that is signposted. Citizens of any EU country (including Metropolitan France), Andorra, Iceland, Liechenstein, Monaco, San Marino, and Switzerland can visit and stay visa-free for a unlimited time in New Caledonia. Whats more is that citizens of the countries mentioned only have to use their national identity card as a travel document, if taking flights from Metropolitan France to New Caledonia. This can also be done if flying from French Guiana, Guadeloupe, Martinique, Mayotte, and Réunion. Citizens of Antigua and Barbuda, Australia, Bahamas, Barbados, Bolivia, Brazil, Brunei, Canada, Chile, Costa Rica, El Salvador, Guatemala, Honduras, Hong Kong, Israel, Japan, Macau, Malaysia, Mauritius, Mexico, New Zealand, Nicaragua, Panama, Paraguay, Saint Kitts and Nevis, Seychelles, Singapore, South Korea, United States/American Samoa, Uruguay, Vatican City, Venezuela, BOT citizens and subjects, and holders of a valid EU long-term visa or resident permit issued by a Schengen country can visit visa-free for up to 90 days. Countries listed below can also visit-free for up to 90 days, but other requirements are needed. Citizens of Kiribati, Marshall Islands, Micronesia, Nauru, Palau, Papua New Guinea, Samoa, Solomon Islands, Tonga, and Tuvalu can visit visa-free for up to 15 days. And must have trips organized and approved by a French travel agency. New Caledonia Airport (IATA: NOU) (ICAO: NWWW), also known as Tontouta Airport located in Païta, 52km northwest of the capital city of Noumea, (687) 35 11 18, [www.cci-nc.com/tontouta] Air France provides code-share flights from Paris via Tokyo, Osaka, or Seoul. Regular flights are available from Tokyo and Osaka on Aircalin, as New Caledonia is very popular with the Japanese. Air New Zealand  and Qantas  also serve the airport. There are also flights from various Pacific nations, New Zealand, Australia, and Southeast Asia. Aircalin also offer code share flights from a number of these locations. However, there aren't many flights overall, so beware of availability. There is little or no competition on routes, so be very wary of high flight prices. Noumea-Magenta Airport (IATA: GEA) , 4 km from the city centre, (687) 25 14 00. Serves all domestic flights within New Caledonia, such as the Loyalty Islands (Maré, Tiga, Lifou, Ouvéa), from Isle of Pines in the south to Belep Islands in the northern tip of the mainland as well as Koné and Koumac on the west coast and Touho on the east coast. Air Caledonie predominately services all flights within New Caledonia and its Islands. Air Passes are available but you need to book through their office. Baggage restrictions to the Islands is 12kg. Tickets can be bought that allow you to carry more as a foreigner, or you can pay an additional fee at check-in for each leg. 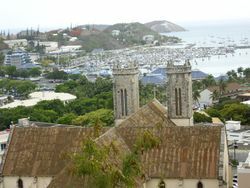 Noumea is a popular port of call for people sailing around the Pacific, though most dare not sail during cyclone season. Expedition company Heritage Expeditions (New Zealand based company) visits New Caledonia each year in April with its 50 passenger expedition ship 'Spirit of Enderby / Professor Kromov' on an expedition that departs New Zealand, visiting several island countries including New Caledonia before finishing in Honiara, Solomon Islands. They navigate waterways using the ship and inflatable zodiacs to visit out-of-the-way islands and communities in expedition-style travel. Main focus of voyages and the daily landings are cultural, wildlife including birding, hiking and underwater snorkeling experiences. Lecture programme onboard unpacks the experiences for those onboard. Hiring a car to travel around the main island of Grand Terre is a great way to experience what this pacific island has to offer and is arguably the easiest and best way to explore Grand Terre. The roads are generally of a high standard and the highway speed limit on the west coast is 110km/h, allowing for fast travel up and down this coast. The east coast has a speed limit of 100km/h and is generally slower to drive around as this coast is hugged by the mountain range, making for more corners and hills. Road maps are readily available from the tourist information office at the Tontouta Airport and roads are well sign posted, making towns around the main island easy to find and driving in Grande Terre an enjoyable travel experience. The buses are not too bad and go pretty much everywhere, but they are infrequent. But they are worth trying and will save you money. A bus from Tontouta Airport to Noumea City is about 400CFP as opposed to 7000CFP but shuttle bus or taxi. The bus company Carsud  Line C services Tontouta airport approximately every hour from about 5am to 6pm. Travel time is about 1 hour 30 minutes. Be aware the terminus from Tontouta is a different part of Noumea than for bus going Magenta Airport if travelling to the Islands. Buses around town: You can catch a bus that will take you very conveniently from the Baie Des Citrons to downtown Noumea for 200CFP each way. This is a good alternative to a taxi. The bus that services this route is the No 1 Bus and it is green. This will assist you on your return to the Baie Des Citrons (and Anse Vata) since you will be looking for the Green Number 1 Bus. The bus ride takes about 15 to 20 minutes. A taxi for the same destination will cost approximately 850CFP each way, compared to 200CFP each way by bus. Taxis do not cruise the streets to pick up passengers as in other cities; they have to be telephoned to come to where you are. This makes the bus a good alternative as the total journey time is not much longer than by taxi. If you are in a hotel or other accommodation you can just ask them to call you a taxi. The same applies if you are shopping in Noumea – if you have just purchased something, even groceries in a small store, they will be happy to call you a taxi. New Caledonia is one of the smallest countries in Oceania. New Caledonia is almost like an Island because of where New Caledonia is one of the smallest countries. There are a couple ferry operators to the Loyalty Islands and Isle of Pines. Bettico operates a high speed catamaran that travels to the islands on a regular basis. Hitching is possible, but not advisable. Around celebrations there are many drunk drivers on the roads. Locals prefer to travel during daylight hours when possible as the roads at night are very dangerous and few drivers have sufficient insurance. Jean-Marie Tjibaou Center, a gift from the French Government. The architect was Renzo Piano, an Italian architect. Wandering along the waterfront in Noumea - Baie des Citrons and Anse Vata. Joining a hiking group is generally a good idea, since you then can really enjoy the great scenery without fear of getting lost, or having to stick with conventional tourist spots. The official language is French, and it is difficult to find English speakers outside of Noumea. In Noumea, French, English, and Japanese are widely spoken at hotels, restaurants, and shops. To enjoy a place like this, you should really endeavour to learn some French. Other than that, plenty of conventional souvenirs shops may be found throughout Noumea. New Caledonia is expensive compared to Asian countries but, like everywhere else, cheap compared to Australia. Much of the food needs to be imported. There is no culture of bargaining either and attempting such might cause offence. A beer in the super market is 150CFP. In some of the camping areas meals can be acquired for 850CFP. Restaurant dining can be comparable prices to Australia at around 2200CFP for a main dish. Bougna, a traditional meal among the native Melanesians, which consists of some form of meat, pork, chicken, fruitbat, crab, etc, along with roots such as yams and sweet potatoes. This is wrapped in banana leaves and cooked under hot rocks heated in a fire. All fruits seem to taste very good, unless they are consumed at Koniambo Nickel SAS. Buy food from local markets, which are common to almost every town. Restaurants are expensive. You can eat quite well for about 10EUR at a couple of eateries opposite the library in town. For travellers on a budget, you'll need to observe what the Kanaks do for the best deals. French food is (obviously) a speciality, but the range of foods available can be a little limited. Try mattu. You can recognize a Kava bar (also called a Nakamal) by a red light outside and dim lighting inside. It is about 100CFP compared to 500CFP for a beer, so about a fifth of the price. You drink the Kava immediately once you've purchased it and then go off to a dark bench to relax. There are many places around New Caledonia that are affordable and in good condition. All you have to do is search around and you will find somewhere to sleep within your price range. Volontariat Civil à l'Aide Technique ( VCAT ). Conditions: you must be French or from another EU-member state or a country belonging to the European Economic Area. You must be between 18 and 28 years old (inclusive). You must not have had your civic rights revoked by a court or have been convicted of certain offences. When snorkelling, avoid contact with sea urchins, which are often poisonous, and coral structures, which can cause scrapes that swell badly and take a long time to heal. A sea snake known locally as the Tricot Rayé has a potentially lethal venom, but is not aggressive when left alone, and only attacks when threatened. There are no crocodiles native to New Caledonia. Rogue individuals have been observed on the island no more than twice within the past 200 years, probably swept out from the Solomon Islands. Iodine or a similar disinfectant is invaluable to fight off small infections, which quite commonly occur in most sores and scratches. Some mosquitoes carry the dengue fever virus. There is no vaccination for this. Consult a doctor for more information, and see our Wikitravel article. This page was last edited on 31 January 2019, at 18:53.